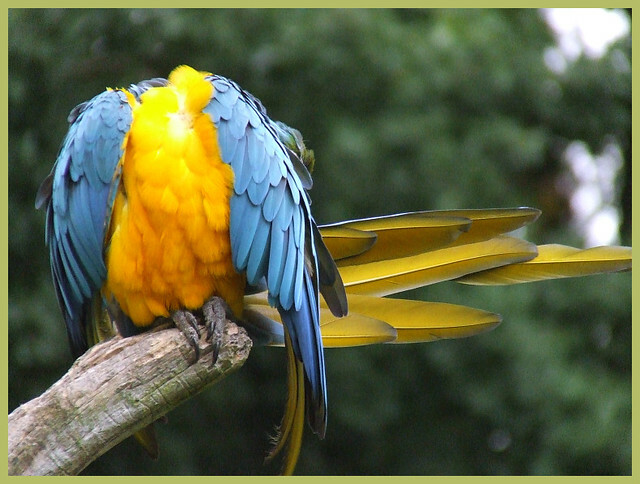 headless macaw | Flickr - Photo Sharing! MiaRossy, Ollie girl, makeupanid, and 3 other people added this photo to their favorites. This pic makes me wanna... say, "where is my head?"" A very nice mulicolored! Funny idea! lol . . .
lovely shot, you really brought out the colors and the detail is very nice. This picture is fun to look at. Schitterend gekiekt, prachtig 'frozen moment'! What did I do with my head? I know it's around here somewhere! Happy Sunny (25%) Yellow Feathery Friday! LOL what a pretty yellow belly! lol no head but the feathers looks great. Cool photo. Sunny yellow goodness! ... Wonderful capture, I love the pose! Happy Sunny (25%) Feathery Friday! It you have the time? Please vote here. Happy The One That Got Away Feathery Friday! This happens to me ALL the time, but usually not so attractively. It's so funny looking with no head like that.